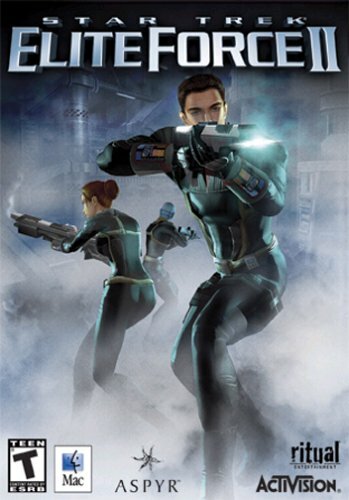 Elite Force 2 was a big disappointment. The original Elite Force was a slightly above average shooter set on Voyager while it was still stuck in the Delta Quadrant. This sequel started off pretty well, but got bogged down and really frustrating near the end. The intro was pretty neat—it takes place when Voyager gets swallowed up into a Borg sphere during the last 5 minutes of the series finale of Voyager. The Hazard Team (of which you, Alex Monroe, are the leader) is sent into the sphere to free Voyager. The rest of the game takes place on Enterprise, where Alex quickly gets stationed. This time around you don’t get to choose the gender of Alex—you get to be male and you like it. But that is a rather minor point. It was fun to be on Enterprise like it was fun to walk around Voyager in the original game. Patrick Stewart does the voice of Picard and that was also very cool. Tuvok and Reginald Barclay also show up and are voiced by the same actors as the series. My only complaint is that the Enterprise levels seemed extremely small. Every deck required a new level to load and so it was extremely painful to move around the ship. Also, since it was all made up of different levels, when you got in a turbo lift you could only go where you were supposed to go, instead of having free run of the ship. In fact, you notice how much you are limited even before the enterprise levels when you get to visit Star Fleet Academy (which looks really nice). It was really nice to walk around and look at all the stuff in the Academy, but I noticed almost immediately that there were invisible walls all around that you couldn’t pass through. You could walk through the garden path, but you couldn’t hop the rails and run around in the grass or in the water. And they didn’t accomplish this by making really high rails that you can’t jump over—they just put invisible walls up everywhere. This pervades most of the game’s levels and broke the immersion tremendously. Another immersion breaker was the amazingly slow load times (on the order of a minute or two in the slowest cases). This is completely unacceptable in my opinion. Even Doom 3, with it’s amazingly complicated texture sets and massive levels loads quicker than Elite Force 2. Add to this the fact that several of the bosses are really hard (I was constant dying and reloading) and you have a recipe for frustration. Yet another hindrance to immersion was the “Gold Starships” that you find lying around. These are scattered around the levels in either hard to reach or out of the way areas and are literally gold starships—models of the enterprise that float in mid air and spin around. When I first saw one I immediately was reminded I was in a game. I felt compelled to find as many as possible, but the payoff for finding them is not worth it at all. In the main menu they have list of unlockable secret levels—each requiring a certain amount of starships to unlock. I got the first few unlocked and they were really lame levels. Not connected to the story at all, they were very short or very hard and they were of absolutely no interest to me. Speaking of secrets, this game has a strange idea of what secrets are. When you exit a level it tells you how many secrets (and how many starships) there are on the level and how many of them you have found. Some of the secrets I found turned out to be very surprising that they were secrets at all. I’d walk around a ever to slightly out of the way dead end and boom—“You’ve found a secret area”. Others were extremely well hidden and I never could find them. The tricorder in this game was used to better effect than I remember in the original game. This time around when you use the tricorder to fix things on the enterprise you play a couple of different minigames. One just makes you alter a sine wave’s frequency, phase, and amplitude to match another sine wave (very easy), and one was like the old “pipes” game, where you have to place pipes and let the energy flow through them without letting it hit certain bad areas. I liked those games, but I felt they should have had more variety. You end up playing the “pipes” one so much that it gets boring. You can also put your tricorder into different modes. One is a “structural integrity” mode that turns explodable objects red so that you can find secrets and such. Another is a trace gas mode that is used in only a couple places—it shows you which vents poisonous gas is escaping from so you can do something about it. I definitely liked the tricorder being useful for once. The phaser in this game seemed weaker than I remember it being in the original. This means you almost never use it, except to break up rocks that your tricorder points out. Or when you run out of regular ammo, which almost never happened to me during the game. There are a lot of weapons in this game, and I didn’t like all of them. A number of them were just standard first person weapons tweaked slightly to fit in the Star Trek universe. There’s a shot-gun, a grenade launcher, a sniper rifle and a rocket launcher—no joke. Very unoriginal, very disappointing. There is also a cheesy love story (if you can even call it that) and a love triangle that requires you to choose between 2 large breasted females at one point. Oh yeah, did I mention that every female in the game has enormous breasts? And a tiny waist. The females look like walking Barbies with Star Trek uniforms and adds to the cheesiness of the game. In the end I got really bored with the game and had to knuckle down just to finish it. The story line starts off interesting, but as it goes on it gets tedious and then just stupid. The final level, set on a Romulan planet, got really hard with crazy, almost impossible bosses—so hard they just became boring because I kept dying and having to restart (waiting way to long for the stupid level to reload). It was all very frustrating and not rewarding in the slightest. Given that the original Elite Force was so fun, I was seriously disappointed by this outing. I hope if they make Elite Force 3 they can take the few good things they added this time and make a game that is actually fun.